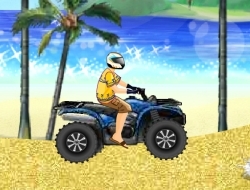 Uphill Rush is a very fun motorcycle game in which you will get to race against the clock or versus another player on tracks that are quite challenging even for an experienced driver. Safely land tricks to gain turbo and then use them to get ahead in the game. After you have completed the motorcycle races you can go on and race in quad bikes or even on skateboards through the city. Complete all the levels and try not to waste too many lives in the process or you might not even complete the championship. Jump at the right time to get some air and maybe score a few tricks. Use the arrow keys to drive, Space to jump and Z for turbo. Uphill Rush 0.00 between 0 and 10 based on 0 votes.